BROCKTON, Mass. 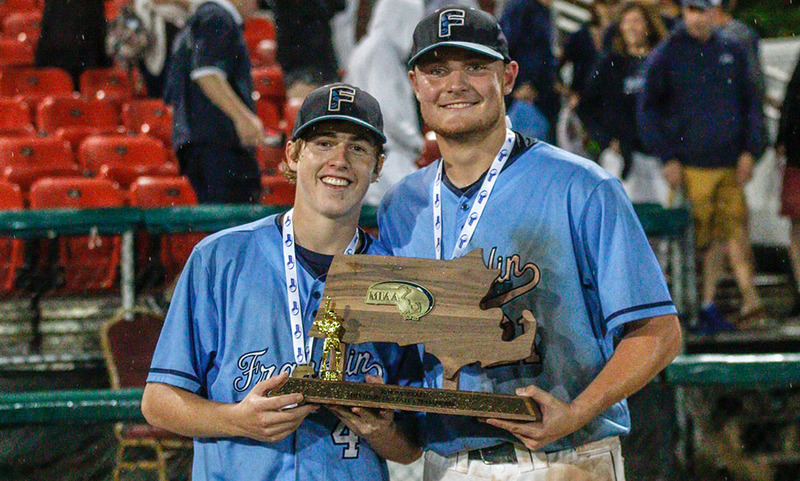 – Once Franklin scored the tying run in the top of the 9th inning during Thursday’s MIAA Super 8 semi-final against Central Catholic, and got two quick outs in the bottom of the inning, the game seemed primed for extra innings. But Central Catholic’s next batter, Vanderbilt-commit Dom Keegan, had other ideas, as he sent a ball high off the wall in left-center field before coasting into third with a triple. Steve Hajjar was hit by a pitch, which set the stage for Mike Borrelli. Borrelli grounded to shortstop, but the throw was wide and looked like it would get by Franklin first baseman Steve Luttazi and give Central a walk-off win. Instead, Luttazi made an incredible pick and held the bag, retiring Borrelli and keeping Franklin alive. The Panthers capitalized, scoring two runs in the top of the tenth, and winning 6-5, to advance to the Super Eight Final. “We had two outs, it was a tie game, looking good, then Keegan gets on third which was a little bit scary, then the play was just a grounder, simple pick, I’ve been doing it for awhile, it was just reactionary, I didn’t feel any pressure, just got the play done and I was excited we got the out,” Luttazi said. In the top of the 10th, Jack Nally led off with an infield single and advanced to second on a sac bunt from Luttazi. JB Floris was hit by a pitch, and Evan Wendell drew a walk which loaded the bases for Colby Fitzgibbons. Fitzgibbons’ grounder to third was mishandled which allowed Nally to score to give Franklin a 5-4 lead. In their next at-bat, Franklin got a very important insurance run, as Scott Elliott’s sac fly scored Floris to put the Panthers up 6-4. In the bottom of the 10th, Bryan Woelfel got two quick outs before walking Sean Thompson and then hitting Mike LeFebre to put the winning run at the plate in Joey Sanchez. Sanchez singled home Thompson from second, but Woelfel battled back to strike out Jake Delaney and give Franklin a 6-5 win. 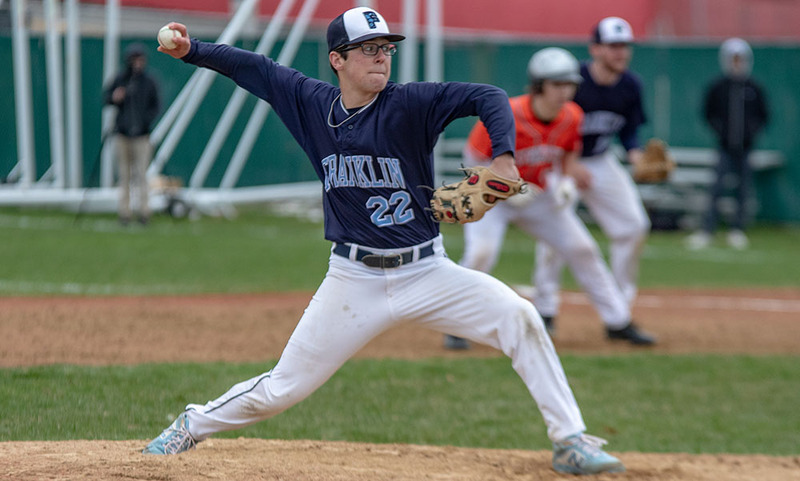 Woelfel’s been one of Franklin’s best pitchers all year, and that was no different on Thursday night, as he went four innings to earn the win in relief, allowing just two hits and striking out three. Franklin scored their first three runs of the game in the top of the second inning, with Nally and Luttazi both hitting singles, while Floris reached on a bunt single. With the bases loaded, Evan Wendell hit a two-run single to center, and Fitzgibbons’ sac fly scored Floris. Franklin had 16 hits in the game, all of which were singles. The Panthers had the chance to break the game open in the top of the third, loading the bases with no outs. But a grounder allowed a throw home for the force out and then another infield grounder was turned into a double play. “We were putting good swings on it, we were giving ourselves chances, and we just weren’t able to get that one big hit to kind of break it open for us, but to our guys’ credit, they just keep grinding, they keep believing, they’re really resilient,” Brown said. Central Catholic had their offensive breakthrough in the bottom of the third with Sanchez leading off the inning with a double and later coming around to score on a two-out double by Hajjar. Borrelli singled home Hajjar, and a walk by Mike Pierro set up Central with runners on first and second. Noah Lucier and Sean Thompson hit back-to-back RBI singles to put Central up 4-3, a lead that would hold until the top of the ninth. In the top of the ninth, Fitzgibbons reached on an error, but a fly out and a strikeout brought Franklin down to their last out. Jack Macchi singled to put runners on first and second for Cooper Ross, who hit a blooper into left field that hung in the air long enough to allow pinch runner Joe Lizotte to score from second. Macchi went to advance to third on the throw home, but the throw to third was wide and went into left field which gave Macchi the opportunity to head towards the plate, but he was cut down on the relay from Central Catholic and tagged out at home. With the win, Franklin baseball moves to the Super 8 final, where they will play the winner of Central Catholic and BC High. Whoever wins that game will have to beat Franklin twice to win the Super 8, as Franklin is the only unbeaten team remaining in the tournament. The date and time for Franklin’s next game has yet to be announced. BROCKTON, Mass. – Franklin has come into the Super 8 with a chip on its shoulder. The last team selected for the elite tournament field, the Panthers are not out to prove that they belong but that they should be one of the teams to beat. 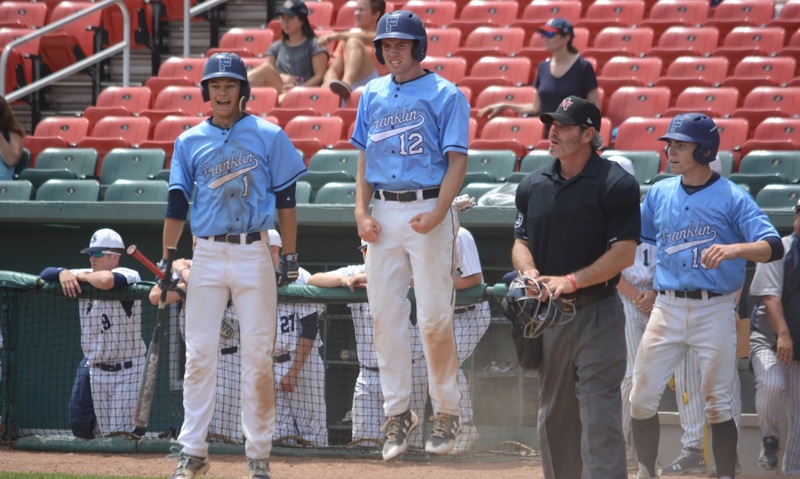 After knocking off second seed Wachusett in the opening round, Franklin squared off with perennial power St. John’s Prep, the third seed, at Brockton’s Campanelli Stadium. It came down to the last out, as these games so often do, but after Jake Noviello induced a weak grounder to second, the Panthers walked away with a 7-6 victory and a spot in the semifinal. “We were the last team into this tournament, so we’ve got nothing to lose and everything to gain,” said Franklin coach Zach Brown about playing the underdog in the Super 8. Bryan Woelfel closed out the win against the Mountaineers just three days earlier, but he was given the ball to start against Prep and it looked as though his start was going to be a short one after the Eagles plated three runs in the third to take the lead for the first time. After that inning, Woelfel held Prep to just three hits (one an infield single) and no runs over the next four and picked up the win. It was a resilient outing for the senior, but one that his coach has come to expect from his pitcher. The Panthers could have been crushed by that three-run burst by Prep in the third. Franklin took the lead in its first at-bat, after back-to-back walks to Scott Elliot and Alex Haba and a bobbled grounder put runners at second and third with two outs. Cooper Ross provided the big hit with a single to right-center that scored both. In the bottom of the first Prep got one back with an unearned run. A two-out error allowed Alex Lane to reach and Mike Yarin (4-for-5, three RBI) brought him home with a single to right. Franklin had two runners on in the second and had a runner at third with one out in the third, but failed to score in either inning. In the bottom of the third, a walk, an infield hit, a walk, back-to-back singles (including a two-RBI hit from Lane) and a sacrifice fly by Jacob Bolger made it 4-2 and seemed to swing the momentum to the Catholic Conference side. But, Steven Luttazi led-off the top of the fourth with a towering blast to right that cut the lead in half and instantly changed the mood on the Franklin bench. Woelfel followed up that homer by getting Prep in order to keep the energy high. In the fifth, Haba started a rally with a double that one-hopped the fence in left center. Jake Macchi moved him over with a sac bunt and two batters later Jack Nally made it pay off with a sac fly to left that tied the game at 4-4. In the bottom of the seventh, Woelfel closed out his outing by getting the side in order, although the final out was a loud one, as Yarin pushed Nally all the way to the wall in right center. The Franklin centerfielder reached up with his back against the wall to pull in a long out. Luttazi drew a one-out walk to start a rally in the eighth. J.B. Floris pinch-hit for Noviello and was hit on the arm. After an infield pop up that was dropped off the bat of Evan Wendell, both runners were able to move into scoring position with two outs. Colby Fitzgibbons drew a walk to load the bases for Elliot and he cleared them, driving a ball into center for a triple that put the Panthers back in front. Reliever Jason Ulrickson gave up a pair of hits in the eighth, but was able to escape a first-and-third, one-out jam. In the ninth, facing the top of the Prep lineup, Ulrickson got a comebacker, a single, and a fielder’s choice to get within one out of the save. Yarin made sure that there was some drama to the finish, crushing a ball to right and cutting the lead to just one. Noviello, the Fairfield University-commit, had warmed up a little between innings and moved from third to the mound to close it out. He allowed a single but then got the grounder to Fitzgibbons that keeps the Panthers in the winner’s bracket. While Franklin is relishing its underdog role in the Super 8, Brown knows that his team is capable of playing at this level. Franklin (19-5) will face Central Catholic in the semifinal on Wednesday at Campanelli Stadium at 7:00. FRANKLIN, Mass. – The Hockomock League is invading the Super 8 tournament. For the first time in its five year existence, the Super 8 will include a Hockomock team; two teams, in fact, as both Mansfield and Franklin were selected by the tournament committee at the MIAA offices on Sunday evening. Mansfield was the fourth team nominated in the first round and Franklin was put up for discussion three teams later. Both received a 5-2 vote from committee members, which put them into the second round for reconsideration. BC High and St. John’s Prep were the only two teams of the 14 nominated that received unanimous 7-0 votes in the first round to get automatic bids. Franklin and Mansfield were joined by Central Catholic, Wachusett, Walpole, Austin Prep, St. John’s Shrewsbury, Catholic Memorial and Lexington up for consideration in the second round. In the second round, the vote goes one-by-one to each committee member and the first school to get four votes is in. Wachusett and Central Catholic were the first two teams to get the required votes, putting them into the Super 8 field. Mansfield, which got three votes in the round that Central Catholic was put in, picked up four straight votes in the third go around to secure it’s spot in the Super 8, resulting in a big sigh of relief from head coach Joe Breen. “I was less nervous proposing to my fiancé,” Breen said. “We’re excited for our boys, they’ve worked really hard and this has been a goal of their’s, not just this year but for the last couple of years. We’re happy to get an opportunity to compete against the best and that’s what we’ll have the chance to do with the teams that are in with us. Walpole and Lexington each picked up four votes to bring the Super 8 field to seven. With just one spot left, Franklin received the first two votes only for St. John’s Shrewsbury to get the next two. But the Panthers picked up the next two votes to earn the final spot in the tournament. While Mansfield will hold the bragging rights for being the first Hockomock team in the Super 8, albeit by three minutes, Breen was equally excited when the Panthers secured the final spot. Brown was quick to reciprocate the respect. After the teams were selected for the Super 8, the committee voted on the seeding. Mansfield earned the #5 seed and will play at #4 Central Catholic. Franklin was seeded at #7 and will travel to play #2 Wachusett. Both games are scheduled for Wednesday at 4:00 PM. The Super 8 tournament is double-elimination. Mansfield and Franklin will play their second game either Friday or Saturday at Campanelli Stadium in Brockton. NORTH ATTLEBORO, Mass. – With two of the best pitchers in the entire state on the mound, scoring chances for North Attleboro and Franklin were going to be hard to come by on Monday afternoon. Franklin’s Jake Noviello and North’s Nick Sinacola, both committed to play at Division 1 schools next year, clashed in what was the true definition of a pitcher’s duel. Noviello allowed one earned run on five hits and one walk, striking out 11 in eight innings of work while Sinacola struck out 12, allowed four, four walks and one earned run in 7.1 innings. It wasn’t until the top of the ninth when the Panthers finally cashed in, exploding for five runs in the top half of the inning to prevail with a 6-1 win over the Rocketeers. “We knew we’d face Sinacola and he’s a great pitcher, and we knew it’d be a great game,” said Franklin head coach Zach Brown. “So we talked about competition, and I think sometimes people forget that competition is back and forth — they answer, then you answer, back and forth. So that was the message prior to the game. We knew there’d be a lot of swings, we just had to stay the course and trust each other. North Attleboro is a great baseball team, they made it really difficult for us today, so hats off to them. North Attleboro’s Zach DeMattio connected on a two-out solo home run in the bottom of the first inning to put Big Red ahead 1-0. But Franklin sophomore Jack Nally answered in the top half of the second, ripping a line drive solo shot down into the bleachers in left field to make it 1-1. Those would be the only runs that the starting pitchers gave up, though each team had a golden chance to take the lead late in the game. North had its best chance in the bottom of the seventh when Nick Raneri reached on a one-out single, and pinch runner Nolan Buckley went all the way to third after an errant pickoff attempt. The Rocketeers tried for a suicide squeeze to bring the winning run in, but Franklin’s defense was prepared. 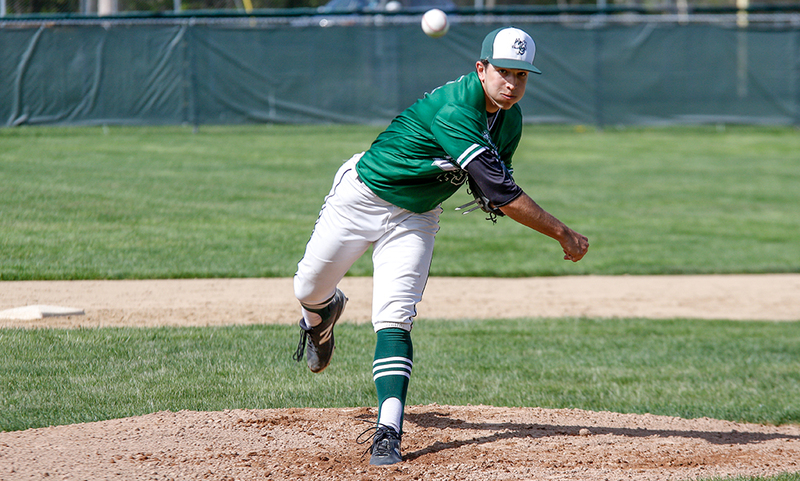 Noviello purposely pitched high and junior catcher Jake Macchi fired down the third base line. Shortstop Alex Haba made a nice play to get back to the bag, took the throw, and then ran down the runner for the second out. Noviello struck out the next batter to end the inning. That momentum carried into the top of the eighth for the Panthers. Evan Wendell (walk) and Scott Elliott (single) reached and then advanced a base on a throwing error. After going up 3-0, Haba was intentionally walked to load the bases. That put an end to Sinacola’s day but senior Ben Arrighi came in and got the job done. The senior made a nice play on a grounder near the first base line to get the force out at home and got a swinging strikeout for the third out to escape the inning without any damage. Noviello didn’t slow down in the bottom of the eighth, sandwiching a pair of strikeouts around a pop up to keep the momentum on the Panthers’ side. Nally got things started in the top of the ninth with a leadoff single and then stole second. Shane O’Neil laid down a sacrifice bunt to advance Nally over, and the sophomore scored on a base hit from senior Michael Langmeyer to make it 2-1. Langmeyer stole second, took third on a groundout, and crossed the plate on an RBI single from Colby Fitzgibbons. Elliott followed with a walk to put runners on first and second and then Haba — who had a two-run home run taken away by a leaping grab from North’s Nathan Pearce in the sixth inning — delivered the knock out blow with a three-run bomb over the press box at Community Field to give Franklin a 6-1 lead. Franklin senior Bryan Woelfel needed just 10 pitches to set North down in order in the ninth inning to close the door. Franklin baseball finishes the regular season 17-5 overall and 12-4 in the Hockomock. If King Philip defeats Mansfield on Thursday, the Panthers will share the Kelley-Rex title with the Hornets. Franklin will find out its postseason fate June 3rd (Super 8) or June 5th (D1 South). North Attleboro (16-2 overall, 12-2 Hock) is back in action on Wednesday against Milford. MANSFIELD, Mass. – With the bases loaded and the go-ahead run at the plate for the visiting Franklin Panthers, Mansfield head coach Joe Breen had no hesitation going to sophomore John Carney in the big moment. Carney needed just four pitches to get the third out — a ground ball to third — to help the Hornets escape from further damage. The sophomore right-hander was just one of many players that stepped up and delivered for the Hornets in a 10-3 victory. There was also senior Justin Pena, who had two hits, two RBI and two runs scored. And senior Mike Hargadon, who was pivotal in getting the Mansfield offense going from the nine-hole with the teams’ first two hits. And of course senior Tyler Dalton, the Hornets’ right-handed starting pitcher that struck out 10 batters in 5.2 innings of work, allowing just five hits to earn the win on the mound. And on top of that, Dalton had a big two-RBI single that sparked a five-run fifth inning for the Hornets. “Our guys have really battled the last couple of weeks, they aren’t afraid of any challenge at this point, and today was no different,” said Mansfield head coach Joe Breen. “Franklin is one of the top teams in the state and Jake Noviello is one of the top pitchers in the state. Franklin scored a run in the first inning but Mansfield tied the game with a run in the third game. It wasn’t until Dalton’s big hit in the fifth that the Hornets had a lead; from there Mansfield’s offense was clicking. Dan Saraceno led off the bottom of the fifth with a single and moved to third on a deep fly ball to left field from Kevin Dow that just landed fair. Dalton plated them both with a single and took second on the throw. Pena delivered with a soft line drive down the left field line to score Dalton. Kyle Moran reached on an infield error and both Pena and Moran moved up a base because of the error. Sophomore Chris Jenkins came up clutch with a single to bring both Pena and Moran home, making it 6-1. “Our approach as a team offensively has certainly improved since the last game,” Breen said. “We’ve seen in the last couple of games, with two strikes, our strikeout numbers are way down. Guys get two strikes on them and it’s now a battle to get them out. I think we had quite a few important two-strike hits today and I think that was the difference. If you foul off some of those pitches, you’re making [Noviello] throw more pitches, and we tried to drive that pitch count up early. Franklin’s offense responded in the top half of the sixth inning but ended up leaving the bases loaded. A one-out single from Scott Elliott and walks to Alex Haba and Jake Macchi loaded the bases for the Panthers. Cooper Ross had a nice at-bat that resulted in a single through the right side for a run and Steven Luttazi drew a two-out walk to bring in another room. Breen brought Carney in for Dalton (5.2 IP, 5 H, 10 K) and the sophomore came up big, getting the third out to leave the bases loaded. The Hornets took advantage of one of Franklin’s five errors in the bottom half of the inning. Sophomore Will Pacheco sandwiched a walk and a hit batter between two outs. It looked like the Panthers would get out of the inning unscathed when Pacheco induced a ground ball, but an infield error allowed Saraceno to score and Dow to take third. Dow then scored on a wild pitch and Cullin Anastasia went from first to third after a throwing error. Pena singled Anastasia in and a double from Moran plated Pena to make it 10-3. “It was just uncharacteristic of us today,” said Franklin coach Zach Brown. “Don’t take anything away from Mansfield, they played great and competed hard. Some of the errors were forced but we had some mental mistakes, some walks, things like that that we haven’t been doing all year. When you’re playing a good team, the margin of error is slim and you have to make sure that you minimize all those things. Unfortunately, we didn’t do that today but we have to bounce right back because we’re playing a good Attleboro team on Wednesday. Franklin took the lead in the top of the first inning when Haba hit one deep to center for a double and then scored when Macchi drilled a bouncer off the third baseman’s glove. Mansfield behind a leadoff double from Hargadon, a groundout that moved Hargadon to third, and then Dow’s high hit to center field was lost, allowing the ball to drop and Hargadon to cross home. Mansfield baseball (9-3 Hockomock, 11-3 overall) moves into a first place tie with the Panthers in the Kelley-Rex division, and with a game in hand. The Hornets are back in action on Wednesday when they host King Philip. Franklin (9-4, 12-4) is scheduled to host Attleboro on the same day. FRANKLIN, Mass. 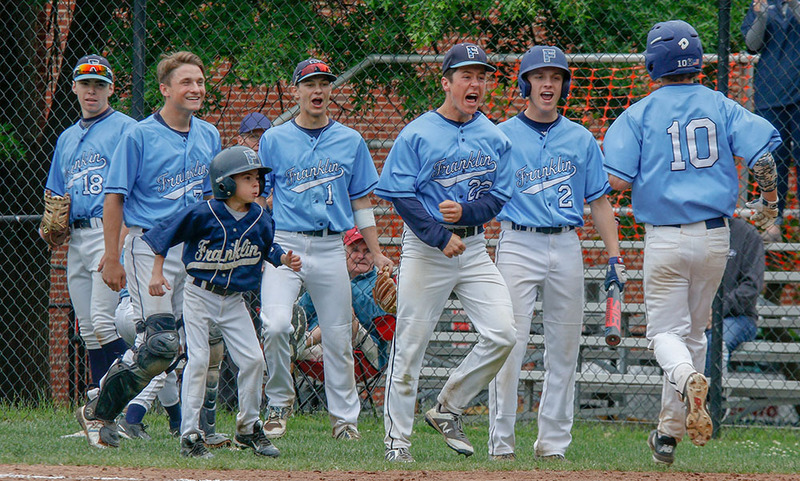 – When Franklin and Oliver Ames met on April 11th, Fmacranklin needed some late game heroics to come out of Easton with an extra innings win. On Monday night in Franklin, the Panthers needed no such heroics, as they walked away with a convincing 10-1 win over the Tigers. It didn’t look like things would be easy for Franklin in the top of the first, as OA’s Michael Friel led off the game with a triple, and then later came home to score on a wild pitch from Jake Noviello. After a strikeout, OA came through with three straight singles from Mitch Goulet, Chris Pearsons, and Matt Muir to load the bases with just one out. Noviello came through though, striking out the next two OA batters to end the top half of the inning with limited damage. In the bottom of the second, Cooper Ross and JB Floris (2-for-2, two runs) hit back-to-back singles, and then Steve Luttazi, in his first game back in the lineup following a pulled hamstring, singled home Ross to tie the game up at 1-1. Floris came home on a passed ball, and Jack Nally (3-for-3, two RBI, run) brought in Luttazi with a single to put Franklin up 3-1. In the top of the fourth, OA’s CJ Deveau singled, but that was the last time a Tiger batter would reach base, as Noviello retired the last 11 batters he faced, including five via strikeout as he finished with nine punchouts in a complete-game effort. In the bottom of the fourth, Franklin’s offense came through again, as Floris drew a walk and then Luttazi doubled which set up Nally, who singled home Floris. A sacrifice bunt by Evan Wendell left Franklin with runners on second and third. A safety squeeze by Colby Fitzgibbons brought home Luttazi and extended the Franklin lead to 5-1. In the bottom of the fifth, Franklin’s Alex Haba and Jake Macchi singled and Floris got hit by a pitch to load the bases with one out, but OA was able to turn a 1-2-3 double play to escape the inning. Franklin broke things up with five runs in the bottom of the sixth as Nally singled and stole second before being singled home by Wendell. Wendell scored on a throwing error which allowed Colby Fitzgibbons to reach second, where he was hit home by Scott Elliott. Macchi delivered with a ball out to center that missed leaving the park by mere feet, and he was able to leg out a triple and score Elliott. Ross singled home Macchi to give Franklin a 10-1 lead. Noviello shut the door in the top of the 7th and the Panthers were able to get the win. Monday’s game marked Franklin’s third straight game in which they scored double digit runs, as they scored 14 runs and 11 runs in wins over Stoughton and Sharon, respectively, before their 10 run outing vs Oliver Ames. In Franklin’s last five games, they’ve totaled 53 runs. Franklin (11-2) will travel to Taunton on Wednesday for a rematch with the Tigers. Taunton bested Franklin 2-0 in their first matchup on April 20th. Oliver Ames (7-4) will head to King Philip on Wednesday. It will be the first meeting between the two this year. Taunton starter Jack Moynihan (21) tossed a complete game shutout, striking out 15 batters, as Taunton beat Franklin 2-0. FRANKLIN, Mass. – The temperatures may have been hovering around 40 degrees and fans and players alike were bundled up as though it were mid-February rather than the middle of April, but Taunton starting pitcher Jack Moynihan was not bothered by the cold. He came out throwing heat and dominated from the opening pitch of Friday’s early season night game at Franklin. Moynihan struck out the first five batters he faced and closed the game by striking out five Panthers over the last two innings. 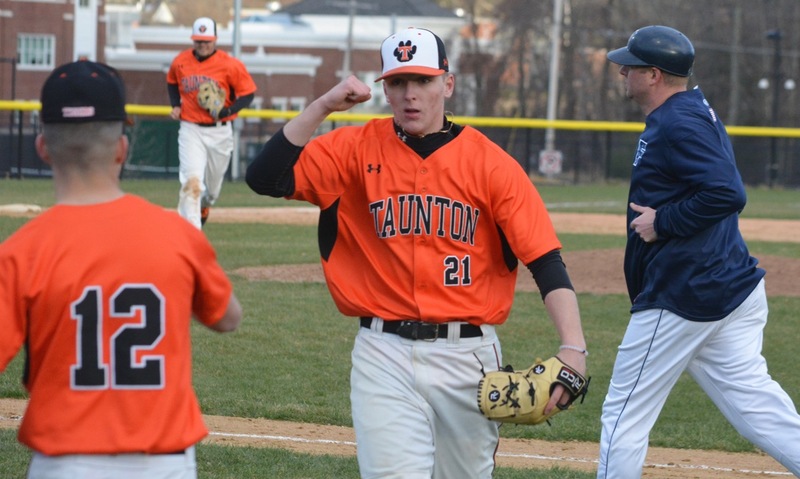 He finished with 15 strikeouts on the evening, allowed only three hits, and tossed a complete game shutout, as Taunton walked away with a 2-0 victory to remain unbeaten. While striking out the side in the first, Moynihan threw strikes on 10-of-11 pitches. He also retired the first two batters in the second on punch outs before Stephen Luttazi became the first Panther to put the ball in play with a grounder to second. Luttazi injured himself coming out of the batter’s box and was forced to leave the game. In the third inning, Moynihan struck out a pair before Franklin finally made solid contact, as nine-hole hitter Colby Fitzgibbons broke up the no-hitter with a double to left center. Moynihan came right back with a strikeout of Jack Nally to end the inning. Franklin, which has been struggling at the plate this season with only 10 runs scored in five games, put together its lone rally in the fourth. Scott Elliott took the first pitch to center for a single and Alex Haba lined a twisting drive down the right field line that Griffin Tomaszycki went full stretch to get a glove to but couldn’t haul in. Elliott had to pause in case it was caught and ended up at third on the single. Haba stole second to put two runners in scoring position and Brown turned to a suicide squeeze with catcher Jake Macchi at the plate. Unfortunately for the Panthers, the sophomore couldn’t get a bunt down and Elliott was easily tagged out by Taunton catcher Ben Joyce. Moynihan ended the threat with a strikeout and a comebacker. The Tigers were not able to turn Moynihan’s dominance into a lead thanks to a strong performance from Franklin starter Bryan Woelfel. Using a repertoire of off-speed pitches, he kept the Tigers off-balance and managed to bear down and work himself out of several early jams. He allowed no earned runs and struck out seven in six innings. Jacob Crawford drew a walk in the first and advanced all the way to third after a single by Christian Simoes (3-for-4, reached base all four plate appearances) and a stolen base, but Woelfel induced a 6-4-3 double play off the bat of Tyler Medeiros to emerge unscathed. Taunton put two runners in scoring position in the third but again Woelfel escaped, this time with a strikeout. A breakthrough finally came in the sixth inning. Simoes lined a double to center to leadoff the inning and, after Woelfel fell behind 3-0 in the count, Medeiros was intentionally walked. A wild pitch allowed both runners to move into scoring position, but Woelfel came back with a pair of strikeouts to get on the verge of another big escape. Tomaszycki hit a slow, bouncing ball on the infield grass that couldn’t be fielded cleanly and allowed the game’s first run to come home. Woelfel limited the damage with another strikeout to end the threat. The Tigers tacked on an important insurance run in the seventh against Franklin reliever Will Pacheco. With one out, leadoff hitter Trevor Pietrzyk dropped a perfect bunt down the third base line to get on base. After a strikeout and a stolen base, he stood on second with two down. Simoes came through in the clutch with his third hit of the night, driving an RBI-double to right center. Two runs was more than enough for Moynihan. He struck out the first two batters he faced in the bottom of the seventh, his 14th and 15th of the night, and got a slow roller to third that looked like it might end the game, but instead the throw skipped away to bring the tying run to the plate. Moynihan got slow bouncing ball to Josh Lajoie at second to end the game. Taunton (6-0, 3-0) will stay in the division on Monday when it hosts King Philip, while Franklin (3-2, 2-2) will be right back on the field on Saturday with a trip to Bishop Feehan.